BUSAN, South Korea, Nov 30 2011 (IPS) - Women toil in the fields for most of their lives producing food and strengthening the largely agricultural economy of African countries, but when their fathers, husbands or older sons die, they are no longer welcome on land they may have tended for years. This observation was made by Hillary Rodham Clinton, United States secretary of state, at a special session on the status of women at the ongoing Fourth High Level Forum on Aid Effectiveness (HLF4) in thi sSouth Korean port city. Some 2,500 delegates, including members of ministerial teams from 160 countries, civil society leaders, experts from multilateral organisations and academics are attending the HLF4 to discuss international principles and rules to improve development co-operation. Many agreed with Clinton’s observation that created a strong image of the status of women in Africa and Asia who earn their livelihoods from natural resources. “Many years ago I travelled to Africa and everywhere I went there were women working in the fields, gathering firewood and in market stalls, and so I asked an economic analyst, how do you account for these contributions by women? And, he said that they didn’t. Because it wasn’t in the formal sector. The situation has not changed significantly for many women in Africa and Asia. “Women still account for at least 70 percent of the 1.3 billion people living in abject poverty. Women work two-thirds of world working hours, produce at least half of the food. Yet, they only earn a paltry 10 percent of world income and own a negligible one percent of world property,” said Michelle Bachelet, executive director of U.N. Women, an entity concerned with gender equality and women’s empowerment. Despite statistics showing that countries that engage women and recognise their contribution achieve greater growth, many African countries are only too willing to offer lip service to the course of gender equality to improve their image at global conferences such as in Busan. “I can sense the same frustration in Bachelet’s voice as she made a case for gender equality. The same frustration that I feel. I ask myself, how much longer do we have to make this case?” Clinton said. Clinton said this is in spite of the fact that credible sources such as the World Bank and the International Monetary Fund have shown that the gross domestic product and per capita income could be higher if women were recognised and integrated into development. From Clinton’s passionate plea for more commitment to gender equality in relation to better implementation of aid, she made it clear that discriminating against women hurts the economy. “In Asia, statistics show that the economy loses about 89 billion dollars every year because of discriminating against women within the labour force. Sadly, this is a region with countries working hard to emerge as leading economies,” Bachelet said. Leading champions of gender equality said women are empowered when they are given an opportunity to go to school, their children are better fed and they too stand a better chance of accessing a good education. A majority of women remain poor with few opportunities to access work that is remunerated, little or no money and little chance to give their children a decent meal. During the recent drought in the Horn of Africa, U.N. statistics showed that of the four million people on the brink of death, two million were children. But this could change. The Busan forum, that ends Thursday, can take this chance to redeem itself with a new and practical solution towards improving the lives of millions of women. What is measured gets noticed, Clinton said. “We are now working on developing data on whose basis gender status can be improved. Today, I am pleased to announce a new initiative, the Evidence and Data for Gender Equality (EDGE). Often, Clinton said, loans are given to small business enterprises without assessing how many of these are owned or run by women. “Consequently, she said, “women continue to face difficulties in accessing credit. 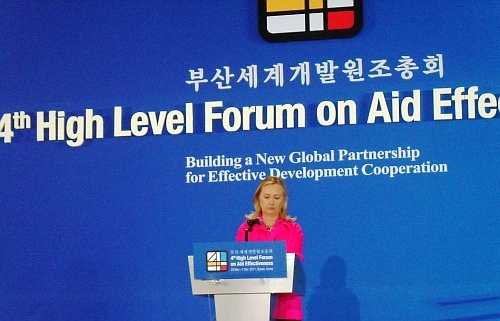 Clinton lauded the Busan forum saying that it created an opportunity for new initiatives and partnerships critical to advancing the struggle for gender equality and the empowerment of women.